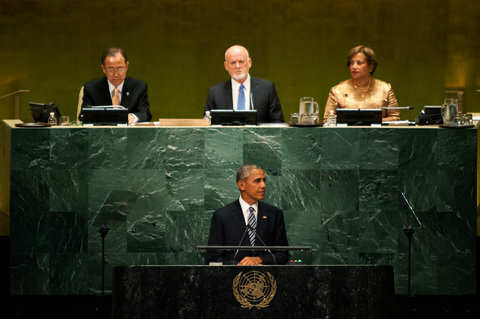 Obama at the United Nations: Hope and Change | "Global Possibilities"
President Obama used his final appearance before the United Nations General Assembly on Tuesday to deliver the kind of speech a troubled world needed to hear. It was a sober yet encouraging assessment of the fast-moving trend toward an integrated world — coupled with a necessary call for reform. The message should have special resonance at home, where a polarizing and ugly presidential election is upending perceptions of American democracy, but also more widely as authoritarian leaders in Russia, China and elsewhere are throwing their weight around and raising tensions. In substantial ways, the world is less violent and more prosperous than ever, yet the forces that have made people interdependent have also exposed fault lines in the international order, Mr. Obama said. The evidence includes millions of refugees fleeing conflicts, terrorists preying on disaffected youths, governments crushing dissent and powerful nations resisting international legal constraints. As a result, many people have lost trust in institutions and governing has become more difficult, he added. But he acknowledged that too often globalization advocates have ignored inequality within and among nations, ignored the enduring pull of ethnic and sectarian identities and left international institutions ill equipped to succeed. Picking up on a theme of the American presidential campaign, Mr. Obama argued that “a world in which 1 percent of humanity controls as much wealth as the other 99 percent will never be stable.” The solution to such imbalance does not lie in reversing integration (an impossibility), igniting new trade wars or applying market-distorting subsidies, he insisted. Rather, he said, the solution is to respect the rights of workers so they can organize into independent unions and earn a living wage, invest in worker education and strengthen the safety net that protects people from hardship and “allows them to take more risks — to look for a new job, or start a new venture.” As much as anything, he seemed to be making a pitch for the 12-nation Trans-Pacific Trade Agreement that he is trying to get Congress to approve before he leaves office. Mr. Obama reaffirmed his belief in working cooperatively with other governments on international issues and said he does not think America can or should impose its system of governance on other countries. “Some argue that the future favors the strongman, a top-down model, rather than strong democratic institutions,” he said. “But I believe this thinking is wrong.” Strongmen ultimately must choose between repression and conflict at home or “scapegoating enemies abroad, which can lead to war,” he explained. One has to wonder whether Mr. Obama was thinking as much about Donald Trump as Russia’s Vladimir Putin and China’s Xi Jinping.